The US Amateur Championship will be played at Chambers Bay in August. Five years from now, the course will be the venue for the US Open. The USGA obviously thinks rather highly of the place. Chambers Bay has been open for nearly three years; plenty of time for all Bellingham golfers to have made the 127-mile trip to University Place to check it out. It’s possible, however, there are still a few in town who have yet to get down to the Robert Trent Jones-designed pseudo-links overlooking Puget Sound. If that’s you, now is definitely the time to go and play the top-ranked public course in the State as it is gearing up for August’s US Amateur Championship when 312 of the world’s best unpaid players will discover just how much fun, and how demanding, this great course can be. 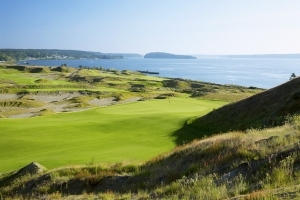 The USGA chose Chambers Bay as the venue for this year’s US Amateur and the 2015 staging of its premier event - the US Open - just seven months after it opened. Of course, golf’s governing body in the US had been keeping tabs on the metamorphosis from one-time gravel pit to golf course long before it actually welcomed its first green-fee paying visitors, but opting for so new and untried a venue was still a bold and largely unprecedented move on the USGA’s part. And not only was the course virtually brand new, it was also owned by Pierce County (Pierce County Public Works and Utilities specifically) meaning it was open to the public. The US Open doesn’t go to many public-access venues as they tend to have less room for TV compounds, exhibition tents, corporate hospitality and the like; it takes weeks to prepare the site which would significantly impact a public course’s revenue (even if the exposure would obviously be beneficial); and then there’s the little matter of public tracks not generally being anywhere near as good as courses owned by private clubs. The only public-access courses that have hosted the US Open, in fact, are Bethpage Black in New York, Torrey Pines in San Diego and Pebble Beach in Monterey, CA, though at $495 a round, Pebble Beach is about as private as a public course can get. Then there’s the location. The Northeast-centric USGA has given the Pacific Northwest a pretty wide berth throughout its 115-year history. This century, Washington has hosted precisely two USGA events – the 2006 US Amateur Public Links Championship at Gold Mountain, and the 2007 US Junior Girl’s Championship at Tacoma Country and Golf Club. Last month, in response to a question asking why the organization had ventured to this corner of the country so infrequently, Ryan Moore said ‘we are a long way from Far Hills, NJ’, where the USGA is based. Lastly, there was the issue of the course’s condition in 2015, something the USGA could not possibly have predicted in February 2008 when the decision to go to Chambers Bay was made. Courageous though the selection undoubtedly was, those that have ventured to Chambers Bay will tell you with some confidence the 2015 event will be one of the most successful US Opens ever. There’s plenty of space (930 acres) for all the peripheral stuff, the large population base will be eager to support the region’s first US Open especially on a course that they themselves can play, the venue will be spectator-friendly with dozens of great vantage points atop the man-made ridges and dunes and, most importantly, the course itself is worthy of a major championship able to identify a ball-striker and competitor of uncommon ability and endurance, no matter what the weather chooses to do. Now that May has arrived, the green fee for non-Pierce County residents is a fairly substantial $155 (that applies through September), but this is a world-class course, so not unreasonable. And if you can find an extra $50, plus tip, hire a caddy to give you the best line off each tee, the most sensible spot on which to land your ball, and a read on the fescue greens which have considerably more break in them than anything you’ll encounter in Bellingham. After having played the course, you’ll have a better understanding of the immense challenge facing participants at the US Amateur and US Open. Mind you, they will likely be taking on an uncompromising beast of 7,585 yards. You probably shouldn’t. Birdie holes: Haha, birdie holes, good one. Professional and top amateurs might lick their lips at the 404-yard 2nd and the two Par 4s (10th and 12th) on the back nine measuring under 400 yards, but the flag at the 10th can only be attacked following a perfectly-placed drive while the humps and bumps on the 12th green make some of St Andrews' putting surfaces look positively flat. Three of the Par 5s head uphill, while the 18th extends to 604 yards. The beautiful downhill Par 3 15th has a relatively flat green (emphasis on 'relatively') and might require only an 8-iron or 9-iron. So it might be considered one of the better opportunities for birdie. Really though, for the average amateur golfer, playing Chambers Bay is all about limiting big, big numbers, not birdie-hunting. Tough holes: Take your pick. The long Par 4 1st is an extraordinarily tough start. The uphill 4th and 8th holes are two of the hardest Par 5s you'll play. The 11th and 14th total 1,021 yards from the back tees yet the scorecard demands they be played in eight strokes! The Par 3 17th, though extremely attractive, has one of Chambers' most rollicking greens, and there's potential for mishap anywhere up the long home hole. A total of 18 USGA Championships have been held in the state of Washington. By the end of this year, the number will be 20 because not only is the US Amateur destined for western Washington, the US Senior Open is also headed our way; Fred Couples, Greg Norman and Tom Watson will hopefully be in the field at Sahalee CC in Sammamish July 29-August 1.